When people talk about social media, they are usually referring to blogs or social networking sites like Facebook, Foursquare, Google+, Twitter, Tumblr, and more recently Pinterest. This is not surprising, given the fact that these are the platforms that most consumers are familiar with, and thus, this is where businesses and traditional media tend to focus. However, there is a type of social media that I find very useful, almost indispensible, that doesn’t receive the attention that it deserves. From the title of this post, you know the amazing resource that I’m writing about is podcasting. The type of podcasts that I am particularly interested in are those that focus on providing information on a specific topic that might be of interest to a particular subset of the population. Often, the best podcasts give users access to insights from experts that were previously only available via lectures in a classroom or a conference, or via summaries in books, blog posts or articles in magazines and newspapers. The great thing about podcasts is that this information is often available for free and on a regular basis. Even better, it is often delivered in the expert’s own voice. Furthermore, as Todd Schnick points out in a recent blog post, titled “10 Benefits to Podcasting [New Audio! ],” there are several ways that businesses can benefit when they add podcasting to their marketing mix. ADVERVE – Hosted by Angela Natividad and Bill Green, ADVERVE covers design, ad goodness, brand stuff, pop culture and almost anything else that they can think of. Both hosts are extremely knowledgeable and fun to listen to. I’d definitely add this podcast to your RSS feed. Be a Beacon Show with David Cohen – This podcast is hosted by David Cohen, brand consultant and artist. The podcast focuses on personal branding and small business entrepreneurship in the age of social information. I met David at the “Shine a Light on Others to Build Your Brand” event at Social Media Atlanta (now Digital Atlanta) back in 2010. David is a very smart guy with some interesting insights to share. If you get a chance, you might also want to check out his doodles. CNN’s Tech Check Podcast – As they say, “The weekly podcast offers a roundup of the week’s technology news, with members of CNN.com’s tech team working to make sense of, and sometimes make light of, the top stories from the digital world.” This podcast regularly features Doug Gross, Stephanie Goldberg, Brandon Griggs and John Sutter. Duct Tape Marketing – Moderated by John Jantch, this marketing podcast is definitely worth your time. If the podcast only featured his thoughts on marketing, it would still be a very valuable resource. However, the fact that his podcast features some of the most respected names in Internet marketing today makes it a podcast that you definitely should be listening to. Intrepid Radio – This podcast is hosted by Todd Schnick, owner of Intrepid Group, LLC. Todd was also a panelist at the Social Media Atlanta “Shine a Light on Others to Build Your Brand” event. He’s a very good guy and his podcast has featured some heavyweight guests, including Guy Kawasaki, David Meerman Scott, Julien Smith, Christopher S. Penn, Jay Baer, and C.C. Chapman. Marketing Over Coffee – This is, by far, is one of my favorite podcasts. Christopher S. Penn and John J. Wall really know their stuff. If your business is doing anything online, you should give them a listen. NPR’s On the Media – This podcast is a great way to listen to past episodes that you didn’t have a chance to listen to when the show aired locally on NPR. Hosted by Bob Garfield and Brooke Gladstone, On the Media is a very entertaining podcast that covers journalism, technology and First Amendment issues. Office Hours – Each week, Vanessa Fox, former Google employee and founder of Nine By Blue, covers questions regarding search engine marketing. If you have a question about SEO, search metrics, social media strategies or just about anything else that you can think of when you think about online marketing, Vanessa Fox can probably give you an answer. (Note: There hasn’t been an episode in a while, but I still wanted to include it on the list). Social Pros Podcast – This is a relatively new podcast that is being moderated by Jay Baer, author of “The NOW Revolution: 7 Shifts to Make Your Business Faster, Smarter and More Social” (affiliate link). After listening to the first few episodes, I think this podcast should be on your list, too. The BeanCast – Each week, host Bob Knorpp and his guests discuss the latest news from the marketing and advertising world. This podcast is always insightful and entertaining. It’s another one of my favorite podcasts. 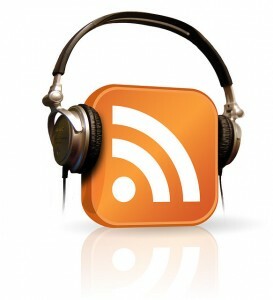 This Week in Law – I recently added this podcast to my RSS feed. In each episode, Denise Howell and the TWiL panel talk about breaking issues regarding technology law. There are many other great marketing and technology podcasts out there—all a person has to do is do a Google search to get additional suggestions. However, if your favorite marketing or technology podcast is not on this list, please let me know about it in the comments section below, as I’m always looking for additional sources of information. Podcasts are a great resource for information. No matter what you are interested in, I’m sure there is someone out there podcasting about that topic. And, if not, this might be something that you might want to consider doing. Keep in mind, podcast listeners aren’t the only ones who benefit from podcasts. As Todd Schnick points out in his blog post, podcasting can also be very beneficial to your business. Photo credit: Colleen AF Venable on Flickr.